1Department of Biochemistry, Federal University of Pernambuco, Recife, Brazil; 2Department of Biophysics and Radiobiology, Federal University of Pernambuco, Recife, Brazil; 3Department of Biochemistry, Federal University of São Paulo, São Paulo, Brazil; 4Department of Pharmaceutical Science, Federal University of Pernambuco, Recife, Brazil. Received April 26th, 2011; revised May 26th, 2011; accepted June 4th, 2011. Food irradiation has the purpose of destroying insects or microorganisms, thereby increasing the safety and shelf life of foods. Flavonoids are ubiquitous plant secondary products with radical scavenger ability. In the present study their antioxidant stability after gamma irradiation was evaluated. The flavonoids showed fast scavenger ability measured with the 2.2-diphenyl-1-picrylhydrazyl radical (DPPH) after high doses of radiation. The low damage caused by irradiation on antioxidant capacity of the flavonoids shows their potential use in combating chemical oxidation of biomolecules in irradiated foods. Radiation treatments of biological materials have been applied for various processes: sterilization of materials, reduction of microbial contamination of food, and increasing the safety and shelf life of foods. Gamma irradiation can damage biomolecules directly by rupturing covalent bonds as a result of transfer of photon energy, and indirectly, by producing free radicals and other non-radical reactive oxygen species . Investigations have shown that free radicals cause chemical oxidation  and oxidative stress  which makes the recovery of biologically active materials unlikely. Flavonoids are among the most ubiquitous of plant secondary metabolites and aid in the reproduction and protecttion of plants . Their low toxicity and high antioxidant activity  have been documented. The evaluation of the radioprotective effects of flavonoids on organoleptic properties, sensory and cytological has been described in strawberries . Recently, some studies showed the radioprotective effects of flavonoids in gamma-irradiated mice [7-9]. Irradiated flavonoid solutions produce chemical reactions between the solute and reactive species, which are the result of the radiolyzed solvent operating to quickly repair the chemical modifications to biomolecules [10,11]. One of the most important probes for evaluating the fast repair of antioxidant capacity is the 2.2-diphenyl-1- picrylhydrazyl radical (DPPH), a stable nitrogen synthetic radical . Therefore, the aim of our study was to evaluate the free radical scavenging ability and radiostability of flavonoids isolated from S. jacobinensis bark after a high dose of γ-radiation. S. jacobinensis bark was collected from trees in the semi-arid region of the state of Pernambuco, Brazil. S. jacobinensis dry bark was mixed in a beaker with 250 ml of ethanol/acetic acid/water (70:4:26, v:v:v) for 2 h at 4˚C. 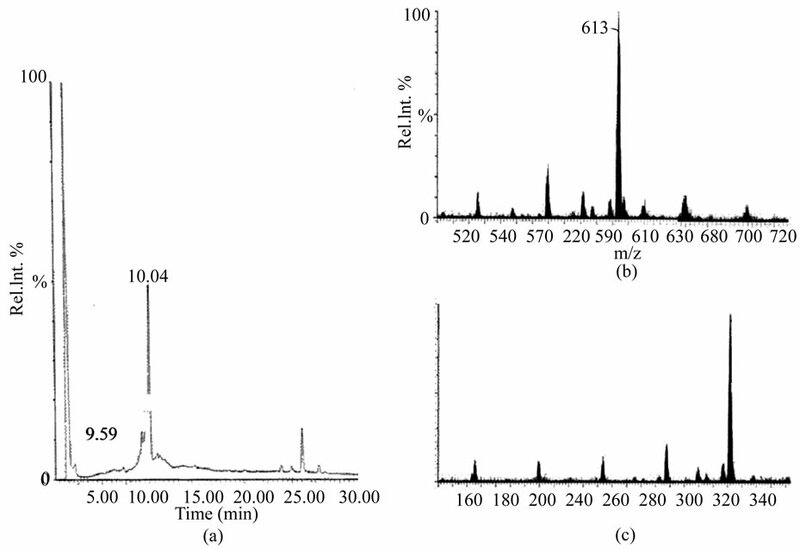 The extract containing flavonoids was chromatographed in an anion-exchange DEAE-Cellulose (Sigma) column (40 × 2.5 cm) equilibrated with ethanol-water (70:30, v:v). Elution was performed with ethanol-acetic acid-water (70:4:26, v:v:v) at a flow rate of 2 ml/min. Each fraction collected was checked by thin layer chromatography (TLC) to determine their compositions using ethyl acetate/formic acid/acetic acid/water (100:11:11:26, v:v:v:v). Vanillin dipping in hydrochloric acid was used for detection under UV (254 nm). TLC conditions were optimized using (+)-catechin standard. The obtained flavonoid was denominated SejaBF. The analysis of SejaBF was revealed by LC analyses (Waters) with a diode-array detector, in a Deltapak C18 column (2.0 mm × 150 mm; 3.5 µm size; 60 Å; Walters) at a flow rate of 0.4 ml/min, keeping the column at a constant temperature (30˚C) and using 0.1% TFA/H2O (solvent A) and 90% ACN/0.1 % TFA/H2O (solvent B) as solvents. A linear gradient elution was used with 5% - 95% B in A for 30 min. The molecular mass was determined by electrospray ionization ion-trap mass spectrometry using a Waters LC/ESI+/MS scanning at 200 - 2500 m/z. The SejaBF aliquots (1 mg/ml) in 10 mM phosphate buffer (pH 7.0) in borosilicate glass vials (16 - 125 mm) were frozen and irradiated in atmospheric O2 using a Gammacell 220 Excel 60Co gamma ray irradiator (Ontario, Canada) at doses of 0.020, 0.8, 3.0 and 35 kGy at a rate of 8.8 kGy/h. Spectrophotometric analysis was used to determine the inhibition concentration (IC50) and the inhibition percentage (IP). IC50 is the amount of antioxidant necessary to decrease the initial concentration of DPPH radical (75 µM) by 50%. IP is the percentage of total DPPH radical (75 µM) which reacted with antioxidant at the steady state (20 min). The experiments were performed using the SmartSpec 3000 spectrophotometer (Bio-Rad) according to the methods of Soler-Rivas  and Moure . Pure methanol was used as a negative control. 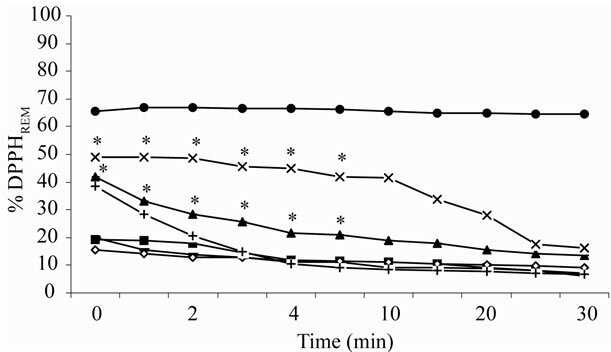 (+)-Catechin and ascorbate in methanol (1 mg/ml) were used as positive controls. The disappearrance of the DPPH radical was monitored by the decrease in absorbance at 515 nm. The DPPH radical concentration in the reaction mixture was calculated by the calibration curve according to the following nonlinear regression equation (R = 0.997): A515 nm = 0.01029 [DPPH] – 0.0177, where [DPPH] is expressed in mg/ml. Data are presented as mean ± S.E.M of five independent experiments. The curve, student’s t test and its 95% confidence intervals (CI 95%) were obtained by nonlinear regression using the GraphPrism® program (GraphPad Software Inc., San Diego, CA, USA). Figure 1. S. jacobinensis flavonoids (SejaBF) ESI-MS spectra. SejaBF reverse phase chromatography in C18 column by HPLC system (a). MS with retention time of 10.04 min (b) and 9.59 min (c).
. The identification of heterogeneous adducts by antioxidant capacity and HPLC/MS protocol was demonstrated in order to perform an analysis of the procyanidins . However, UV/VIS spectrum and a fragmentation pattern (MS/MS) should be used in future studies for complete characterization. 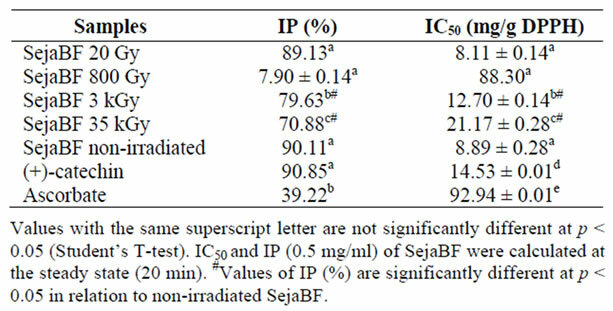 SejaBF exhibited high antioxidant capacity by the DPPH method when compared to ascorbate, an antioxidant widely used as a standard. However, its antioxidant activity decreased after irradiation, in relation to the IC50 and IP (Table 1). IP reduction (19.2% at high dose) was significant although the IC50 reduction was not. DPPH radical scavenger capacity (%DPPHREM) was significantly reduced only in the initial 5 min after a high dose of radiation (Figure 2). The DPPH radical is scavenged by antioxidants through donation of hydrogen to form a stable, reduced DPPH molecule. The radical scavenger is reduced after high doses of gamma radiation due to displacement from the B-ring to the 2.3-double bond, indicating a relatively small reactivity (because of the absence of high density spin on a given site) for these intermediate species [17,18]. The existence of such intermediate species after irradiation apparently does not abolish the antioxidant properties and can maintain the radioprotective effects of flavonoids. A feature already observed in gamma-irradiated strawberry . Our results are in good agreement with the presence of stabilized quinones, which have been observed after H-abstraction from the B-ring of flavonoids in radiolytic solutions . Irradiation can cause oxidative damage and impair flavor in food. However, the action of effective and radiostable natural antioxidants may prevent chemical oxidation of biomolecules in irradiated food. Table 1. Radical scavenging performance. Figure 2. Kinetic behaviour of irradiated antioxidants. The error in the determination of %DPPHREM to relative values of different doses is approximately ± 1%, smaller than the size of the symbols. *Values significantly different at p < 0.05 (Student’s T-test) in relation to (○) non-irradiated S. jacobinensis flavonoids (SejaBF). SejaBF after irradiation: (x) 35 kGy; (▲) 3 kGy; (■) 800 Gy; () 20 Gy; (●) ascorbate and (+)-catechin. Pernambuco (UFPE) for access to their facility and for assistance. W. Brand-Williams, M. E. Cuvelier and C. Berset, “Use of a Free Radical Method to Evaluate Antioxidant Activity,” LWT-Food Science and Technology, Vol. 28, No. 1, 1995, pp. 25-30. C. Soler-Rivas, J. C. Espın and H. J. Wichers, “An Easy and Fast Test to Compare Total Free Radical Scavenger Capacity of Foodstuffs,” Phytochemistry Analysis, Vol.